For some 40 years the water pressure at the end of Higher Goongumpas Lane has been low and on the odd occasion would drop to zero. The view of South West Water was that there were "too many properties on the private supply pipe" and that it was a private supply and as such not their responsibility which they said ended at the end of their main in Lower Goongumpas lane near the property Tailings End. About seven years ago the water pressure became unacceptable since it dropped to zero practically every day for about an hour and it was obvious that someone else had tapped into our supply. SWW were consulted again but their view remained that "It was a private matter and nothing to do with them as their responsibility ended at Tailings End". About four years ago we requested SWW install a meter on the boundary of Goon Farm land so that we could check if the person that was using our supply had tapped into it on Goon Farm land but SWW refused to do this stating again that "It was a private supply, the pressure at their main at Tailings End was up to standard and anything after that was a private matter". 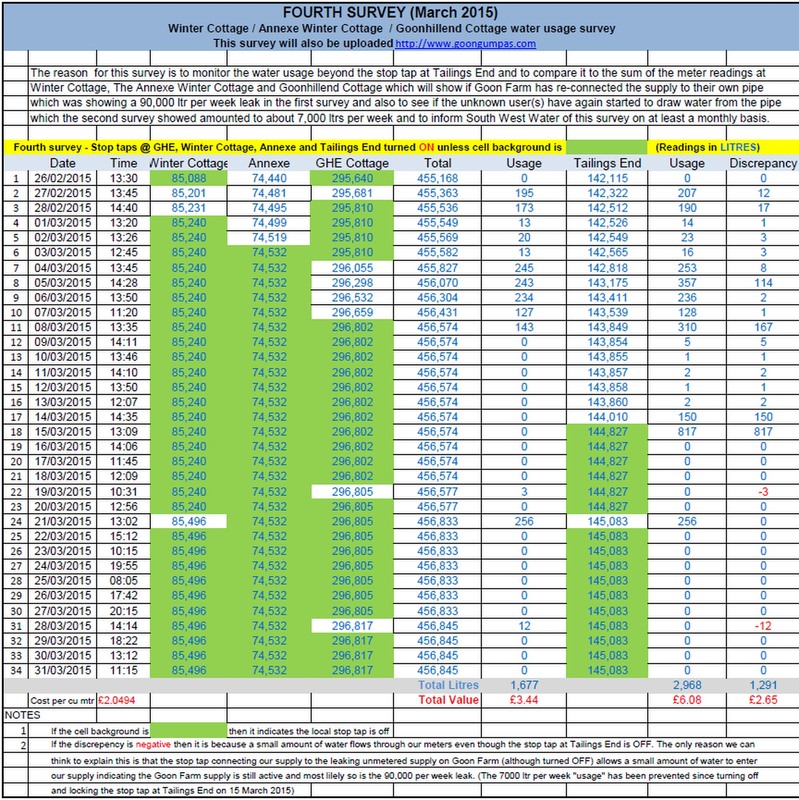 We started to monitor the dates and times we noticed the water pressure dropped to zero and informed SWW of these dates and times (copies of the dates and times of zero pressure noticed by the occupant of Winter Cottage Annexe can be viewed here). About three years ago Mr Symonds from SWW visited and informed us that the owners of Carn View and Harmony Cottage had also complained of low water pressure and had been advised to install new supply pipes from Tailings End to their properties and they were in the process of doing this work. He suggested we join in with them but we did not think that a good idea partly because of the considerable cost and partly because we were of the view that if these properties were on the same supply as us (which was very likely) then the pressure would improve once they had installed the new supply and disconnected the old. Unfortunately once the new supplies had been installed it made no difference whatsoever to our supply which remained low pressure and stopped altogether on more or less a daily basis for about an hour and we again complained to SWW about this but again they insisted it was "private" supply and not their responsibility. 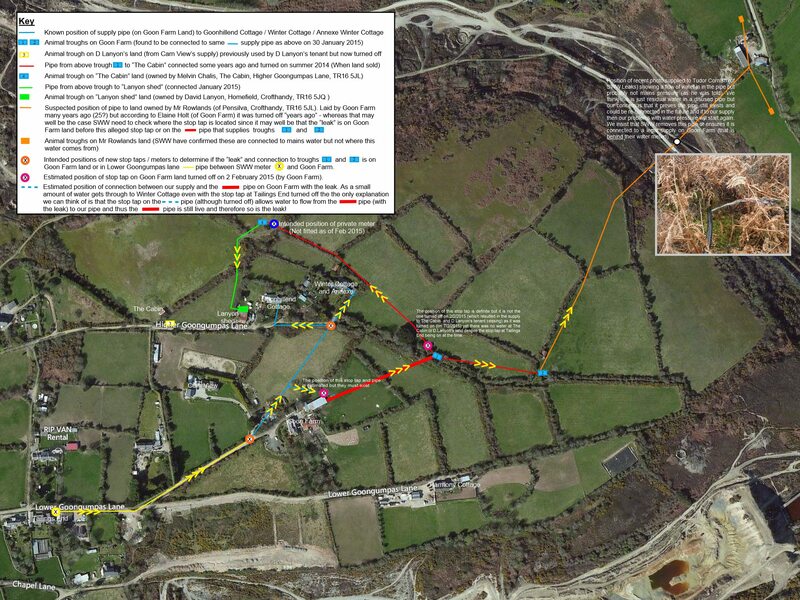 At this time we discovered an "easement" in the deeds of Winter Cottage which included a map which clearly showed that the pipe was laid in Lower Goongumpas Lane (a communication pipe) before becoming a private pipe on entering Goon Farm land and a copy of this was emailed to Allister Symonds on 4 March 2013. 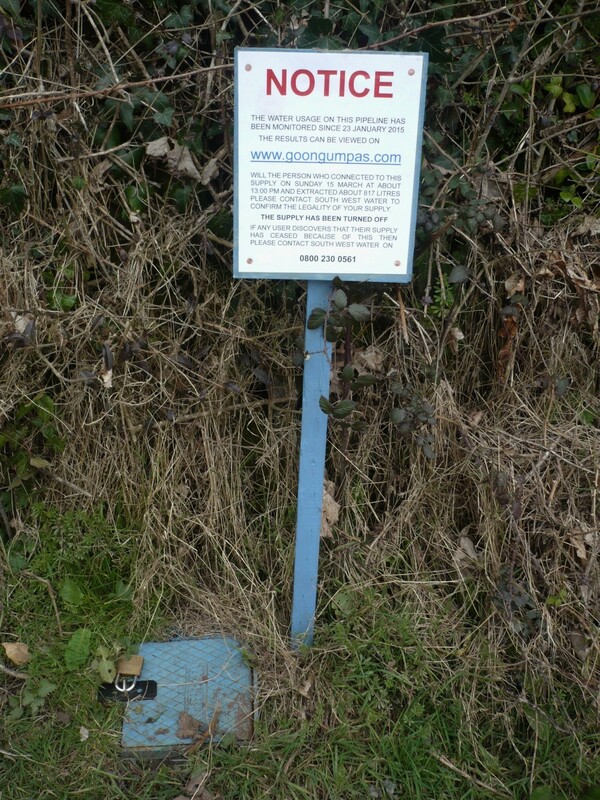 Mr Symonds should have realized the significance of this easement and informed SWW that their responsibility did not end at Tailings End but at the point where the pipe entered private land at Goon Farm but it appears he kept this information to himself as it was not until 2017 that SWW acknowledged they had seen a copy of it. As it turned out Mr Symonds' advice was very poor (and expensive) advice because if he had done what we asked - check the troughs on Goon Farm and on the land Goon Farm had for sale - then he would have discovered that they were not fed from behind Goon Farm's meter but were connected to our supply and furthermore he would have discovered that the low pressure was due to a serious leak on Goon Farm and not "too many properties on the private supply". Furthermore he would have discovered that the troughs posed a very serious risk of polluting the water supply as there was no backflow protection and they were not only connected directly to our supply but also the the main at Tailings End because at that time there was no stop tap / meter (with a double check valve) installed (see below). We again asked SWW to install a meter at the edge of Goon Farm's land (in Lower Goongumpas Lane) but again they refused however they did agree to install a stop tap / meter on the pipe at Tailings End late in 2013. This meter revealed a steady flow which SWW attributed to a leak somewhere on the half mile of pipe to our properties (approximately two thirds of which is in Lower Goongumpas lane). SWW then installed a "logging" meter which they told us indicated a leak of 5 or 6 litres per minute and also another unknown connection to our supply extracting about 200 litres per day usually, but not always, around dusk. On 28 April 2014 SWW sent us a letter stating they had "found a leak" on the service pipe to our properties and we had 30 days in which to fix it or face prosecution (a copy can be viewed here). We did nothing about this as the cost of digging up nearly half a mile of pipe two thirds of which is in Lower Goongumpas Lane would be enormous, extremely inconvenient for any residents in Lower Goongumpas Lane and anyway was it a leak? Was it on our supply? Or was it on someone else connected to our supply without our permission? Was it in Lower Goongumpas lane or on Goon Farm land? In January 2015 we had another attempt to get SWW to do something about the problem that our water supply stopped every day for about an hour but again they insisted "it was a private supply and our problem". Mr Kevin Bray (from SWW) visited and insisted it was our problem, there was a leak and it "was our responsibility to fix it" otherwise SWW would "take legal action against us". Mr Bray justified that it was solely our problem because "when he had cut off the supply to install a stop tap and meter in 2013 nobody else had complained that their water supply had stopped". Faced with the 28 April 2014 threatening letter and Mr Kevin Bray's January 2015 verbal threat of litigation we decided that we had no alternative but to do something. We would not employ any of the contractors suggested by SWW but would act as our own contractor. We asked that SWW point out where the stop tap at Tailings End was located (which they did) and also asked that SWW re-install a meter at Tailings End (which they did). It was our intention to install a meter on the boundary of Goon Farm land both in Lower Goongumpas Lane and in Higher Goongumpas Lane (see above map). Mr Tudor Cornish of SWW refused to lend us meters but we discovered that we could buy private water meters for about £35. It was our intention, via these meters, to discover if the leak and/or the other connection(s) to our supply were located on Goon Farm's land or in Lower Goongumpas Lane - the idea being to narrow down the search. SWW installed a meter on the stop tap at Tailings End on 23 January 2015 at about 11:00 AM which gave us the ability to turn off the supply so that we could install our own meters on Goon Farm's boundary without getting soaked and check where the leak etc was located. Before installing our meters we decided to conduct a survey of the usage on the supply (not including us as we had collected enough rain water and stored drinking water to last about a week). As can be seen our first survey revealed that 97,190 litres of water registered on the Tailings End meter in 7 days and none of this was due to us as our stop taps were off! This is a staggering amount of water, enough to fill Carn Brea swimming pool about every 4 weeks and this wastage has been going on for years. SWW now state they have their own meter on their main so if they had checked it when we first complained about low water pressure about 42 years ago it would have revealed that there was "something wrong". Thank you for your 4 July 2017 email concluding my complaint against Chris Broxton regarding her 9 June 2017 letter. As you know from our 5 July 2017 phone call I do not agree with your conclusion as I consider Chris Broxton’s 26 June 2017 letter to be even more deceitful than her 9 June 2017 one. I will be writing to Chris Broxton explaining why in due course but a 10 July 2017 draft of my letter can be viewed HERE now. This diagram together with Dr Parry’s statement in his 22 February 2017 letter to CCWater that “In the event that the pipe travels from Mr Layte’s stop tap along Lower Goongumpas Lane and within the boundary of the street then this would be a communication pipe and the responsibility of SWW” is surely all that CCWater need to disagree with SWW’s claim that the pipe is entirely a private supply? In addition to Dr Parry’s statement Mike Shannon, in our 4 March 2016 meeting, stated “the first part of the pipe from the stop tap / meter in Lower Goongumpas lane is a communication pipe” although I am told he now cannot recollect stating this and apparently denied being shown a copy of Sarah Newton (MP) 3 March 2016 email at the same meeting (see Chris Broxton’s 9 June 2017 letter highlighted text). Unfortunately Mike Shannon denied my request to record the meeting ☹. It is obvious that in the past SWW have told CCWater that the pipe is private and CCWater has believed this which has resulted in CCWater dismissing our complaint “as a private matter” - as can be seen in the 11 April 2014 letter from Brendan Green and the 15 October 2015 email from Neil Whiteman to Chris Bloxton you sent me on 5 July 2017 (I will be commenting further on this exchange later, sorry!). When we first complained about low / zero water pressure back in 2009 – 2010 SWW said it was a private matter as their responsibility ended at the end of their main near Tailings End in Lower Goongumpas lane and the pipe from there was a private pipe. 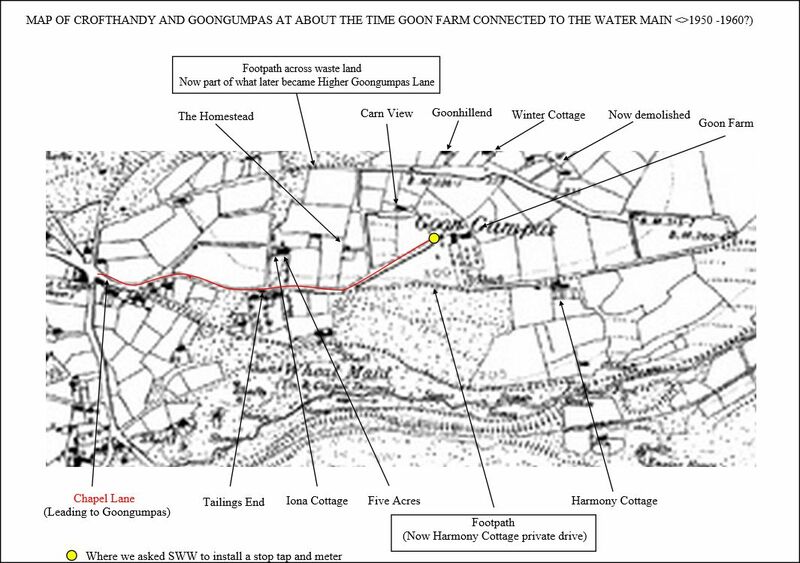 We didn’t know how our water got from there to our properties so we had to take their word for it but in early 2013 we discovered a map and easement in the deeds of Winter Cottage that showed the pipe was laid in Lower Goongumpas Lane until it entered Goon Farm at their boundary. On 4 March 2013 we emailed SWW’s Allister Symonds with a copy of this map and easement and included an old aerial photo of Winter Cottage and a list of dates and times our water supply had dropped to zero (Prepared by Mr Bellward of the Annexe Winter Cottage). Although we did not realise the significance of the map showing part of the pipe to be laid in the lane at the time as we knew nothing about communication pipes and SWW’s responsibility for them but Allister Symonds should have done. If he doubted the map’s accuracy it would have been a simple matter to check by excavating the lane, as we have now done, but it appears he did nothing and kept “mum” about the map and easement. The only response we have had from Allister Symonds since 4 March 2013 is his 9 March 2015 email deleting without reading the 8 February 2015 email (subject Water problems at Goongumpas). The 4 March 2013 email was sent to CCWater and SWW on numerous occasions and one would have thought that SWW would have realized its significance and investigated the map’s authenticity by excavating the lane but again it appears nobody did. When SWW excavated the lane to install the stop tap and meter we had requested in late 2013 the installer (understood to be Kevin Bray) would surely have reported that the map was wrong and the pipe entered private land adjacent to the meter if it did but as it didn’t he should have reported that too as it would have ended SWW’s claim that it was a private supply pipe four years ago. 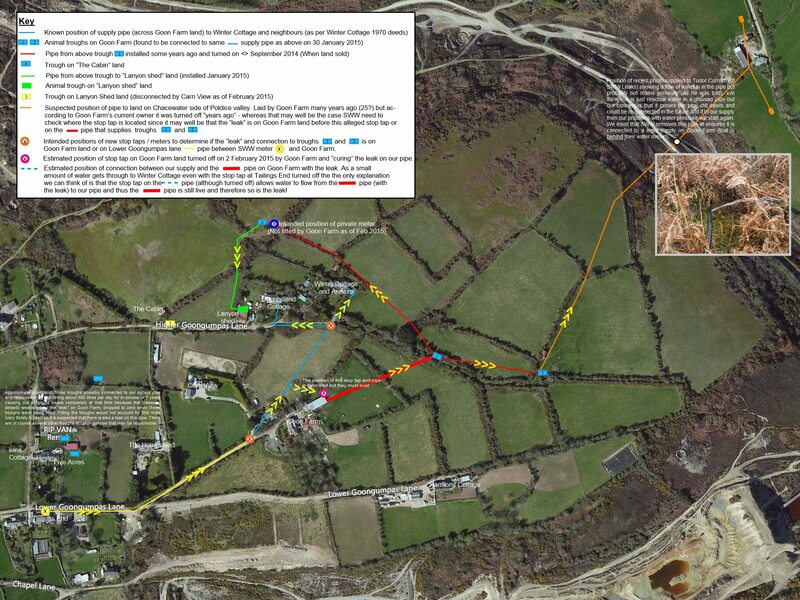 As you know we excavated the area around the Lower Goongumpas lane stop tap ourselves on 20 June 2017 and discovered the pipe does go down the lane towards Goon Farm thus verifying the map attached to the 4 March 2013 email was authentic as can be confirmed from our 27 June 2017 email to CCWater. As I said in our 5 July 2017 phone call I am not happy with any CCWater complaint resolution dismissing our claim that relies on a lie from SWW and believe that any such resolutions must be themselves dismissed. SWW employees that have had sight / should have had sight of the map and easement attached to our 4 March 2013 email and have stated “it is a private matter involving a private supply” (or similar) should apologies and resign (or be severely reprimanded) and we should be compensated for the vast amount of time we had to spend dealing with this matter because of their incompetence and/or lies. Provisional list of SWW employees who have stated in letters or emails “it is a private matter involving a private supply” (or similar). Kristian Barber in his 14 February 2014 11:21 email. Mathew Moore in his 28 February 2014 letter (sent to Winter Cottage + Goonhillend + The Annexe Winter Cottage). Sarah Harvey in her 3 July 2014 09:29 email. Tracy Symons in her 25 November 2016 letter – however it has come to light that the map and easement together with other important maps may have been withheld from Tracy Symons whilst preparing her letter which explains her belief that the pipe enters Five Acres land at Tailings End rather than traveling down the lane towards Goon Farm as the maps show (please see 10 July 2017 Draft letter to Chris Bloxton for an explanation as to why I believe these maps and easement were withheld from her). Chris Bloxton in her 11 July 2017 17:40 email to me – This email is an incredible pack of lies and nonsense but has obviously just arrived and as yet I have not responded to it but I will be doing so! Provisional list of SWW employees who have stated verbally “This is a private matter” (or similar) but there is no record in writing. Obviously all these people base their belief that this is a private supply pipe on some sort of information provided to them by others as they can’t possibly know first hand themselves. Your 3 April 2017 email states “South West Water has explained on what information it has relied upon in reaching the conclusion that the pipe is a supply pipe”. Will CCWater please provide me with precisely what information SWW have provided you with. Lesser complaints regarding SWW employees will be made separately from the main complaint. These all relate to SWW regulations team’s false claim of regulation violations concerning the rain water harvesting installation at Goonhillend. Despite my informing SWW’s “Customer Leakage” department both verbally and in writing about this installation in January and early February (see 30 January 2015 email and 2 February 205 email) SWW’s Dr Parry (in his 22 February 2017 letter to CCWater) and Robert Goulden’s 7 August 2015 letter both claim it was not until April 2015 that SWW’s regulation team became aware of it. If “Customer Leakage” was the wrong Department to inform about the rainwater harvesting system they should have told me or informed the Regulations team themselves. An apology from both Dr Parry and Robert Goulden is required. Of the list of violations SWW claimed only one was true. I had wanted to keep the (turned off) mains feed to the rainwater distribution tank in the roof at Goonhillend to use in case of drought but SWW insisted I must install one of two backflow prevention “devices” they suggested or permanently remove the mains pipework feeding tank. I was not impressed with either backflow prevention device suggested and explained why. I informed SWW I would be permanently disconnecting the pipework and not installing backflow prevention. When Richard Harrison visited to inspect that I had permanently disconnected the pipework on 17 September 2015 he refused to do so and falsely claimed I had “deliberately installed pipework to restrict access” as can be seen in this YouTube video. He then reported back to SWW legal department and claimed I had deliberately prevented him from inspecting the roof space at Goonhillend resulting in this 22 September 2015 unacceptable letter from Paul Mitchell and my 9 October 2015 response to it (attached to my 11 October 2015 email). It is totally unacceptable that a SWW employee should accuse a customer of something they are not guilty of and I call for Richard Harrison to be strongly reprimanded if not dismissed. As to Paul Mitchell he should apologies for being so easily deceived and in future I suggest he take anything Richard Harrison tells him with a pinch of salt. I am not sure whether CCWater should restore the original complaint number (161028-000040) or treat it as a new complaint but as we could not have made a complaint such as this before discovering the pipe was in the lane on 20 June 2017 I think it should be treated as a new complaint. Thank you for your 26 June 2017 letter and enclosures an on-line copy of which can be viewed HERE. I am no more impressed with this letter than I was with your 9 June 2017 letter and enclosures. Your 9 June 2017 letter enclosed documents requested some six months earlier in my 21 December 2016 email to Tracy Symons that you stated “I can assure you that all these documents were reviewed as part of Tracy’s investigations prior to her detailed response to you of 25 November 2016” but as SWW had downloaded about half of them from www.goongumpas.com between 8 May 2017 and 8 June 2017 your statement cannot possibly be true and I emailed you pointing this out on 12 June 2017. Your 26 June 2017 letter encloses copies of the documents I requested that admittedly have not been downloaded from www.goongumpas.com that you describe as “These original documents were obtained from your various correspondence” but they are mostly not the originals as they are copies of the ones I had forwarded to SWW “after the event” which is a different thing altogether. Many of them do not include the attachments without which they are meaningless. For instance your 9 June 2017 letter enclosed a copy of my 4 March 2013 email to Allister Symonds (with monochrome version of the attachments) downloaded from www.goongumpas.com on 6 June 2017 at 17:05 whereas your 26 June 2017 letter enclosed a copy of the email main body (ONLY) with no copy of the attachments which you say was obtained from an email I sent to CCW on 6 February 2014 which of course is not the original. The original (and its attachments) can only be obtained from Allister Symonds’ inbox of 4 March 2013 and will you please obtain a copy from him and ask him why he did not respond to it? I consider my 4 March 2013 email to Allister Symonds to be very important as prior to that (since about 2008 - 2010) all contact with SWW regarding our complaint of low / zero pressure had been verbal (phone or in person). Allister and the several other SWW contacts before him (I did not record their names) had stated that “SWW’s responsibility ended at the end of their main in what is now known as Lower Goongumpas Lane and the pipe from there was a private supply pipe”. Allister (and the others) blamed the low / zero pressure on “too many properties using the same supply pipe”. Allister told us that two other properties – Carn View and Harmony Cottage had also complained of low water pressure and he had advised them to lay new pipes to the Tailings End main and suggested we do the same and join with them to reduce the cost. At the time we had no idea what route our supply pipe took but had long suspected it crossed Goon Farm and requested Allister inspect Goon Farm to check if they were tapping into our supply. On one of many visits from Kevin Bray he reported that he had inspected Goon Farm and not found any connections and also reported that the pressure on Goon Farm was far higher than at our properties and thus, in his opinion, a different supply. We decided not to join in with Carn View and Harmony Cottage and lay new pipes mainly due to the cost but also reasoning that if they were connected to the same supply as ourselves then when they laid new pipes and disconnected from ours our pressure would increase. Following their installing new pipes (from memory 2012) there was no difference. Our pressure was still low and dropped to zero more or less daily and we continued to complain. As has been said before I am not impressed with Allister Symonds because he should surely have realized that if two of the three properties in the area complaining of low water pressure lay new pipes but it makes no difference to the pressure at our properties then the fault must be elsewhere and as the only other property in the area is Goon Farm then something on that property is most likely to be the cause as turned out to be the case years later in February 2015. In early 2013 we obtained the deeds to Winter Cottage with a view to first registering the land and, by chance, Mrs Layte noticed the map and easement for the water supply in the deeds. For the first time we knew the exact path of our water supply and emailed a copy of the map and easement to Allister attached to my 4 March 2013 email . Although we did not know anything about communication pipes and SWW’s responsibility for them at the time Allister Symonds should have done and realized the significance of the map showing the pipe to be (mostly) in the lane and the easement showing the pipe existed prior to 1989 meaning the part in the lane was a communication pipe and SWW’s responsibility ended where the pipe entered private land on Goon Farm’s boundary and not where he had told us at Tailings End. Following my 4 March 2013 email we continued to experience low / zero pressure and continued to complain. Alan Brand took over from Allister Symonds and was made aware of the deeds on one of his visits (and later by email) and the path of the pipe across Goon Farm pointed out to him on one of his visits. I mentioned my suspicions that something on Goon Farm was the likely cause of the low pressure and understand he visited but the problem persisted. We asked that he install a meter on the boundary of Goon Farm but he would not suggesting we did ourselves. Eventually we persuaded SWW to identify the pipe leading to our properties from Tailings end and, after intervention from CCWater, SWW installed a stop tap and meter there in late 2013 and a logging meter on 12 February 2014 (see 14 February 2014 email from Kristian Barber). According to Alan Brand the new stop tap / meter revealed there was a steady flow of about 5 or 6 litres per minute which he identified as a leak and in addition, he said, someone else was extracting about 200 litres per day. On 6 February 2014 I spoke to and emailed Brendan Green of CCWater expressing my concerns about this wastage. On 14 February 2014 I received an email from Kristian Barber of SWW containing the following “In regards to the suspected illegal connection to your supply pipe, this would be a private issue as South West Water has no jurisdiction regarding customer supply pipes. If our investigations identify an illegal connection to your supply pipe, we will seek recompense from the user for the water used however we would not be able disconnect them from the private supply pipe”. This is despite SWW having a copy of the deeds map showing that two thirds of the pipe is not a private pipe but a communication pipe. On 11 April 2014 I received this email from CCwater closing our complaint against SWW on the grounds that it involved a private pipe. This is despite CCWater having a copy of the deeds map showing that two thirds of the pipe is not a private pipe but a communication pipe as you have confirmed in your 26 June 2017 letter (appendix 2). I have to say that I am not impressed with CCWater who obviously preferred to take the easier option that SWW’s opinion that it was a private pipe rather than the evidence they were given that two thirds of it was not. I think CCWater needs to learn from this case and question a water company that claim a pipe laid in the highway is a private pipe as it is much more likely to be a communication pipe. On 28 April 2014 my neighbours at Goonhillend and The Annexe Winter Cottage and I received this threat of litigation if we did not repair the leak SWW claim they had “found” on the private service pipe leading to our properties within 30 days. This is despite SWW having a copy of the deeds map showing that two thirds of the pipe is not a private pipe but a communication pipe. We did nothing as we believed the serious waste of water to be SWW’s problem and not ours (as stated in the 6 February email to Brendan Green). SWW removed the meter from the Tailings End stop tap and we continued to complain about low / zero water pressure. In early 2015 SWW’s Kevin Bray personally threatened me with litigation if I did not fix the leak which he justified as only our (my) problem by stating “nobody else had complained about loss of their supply when he had installed the stop tap / meter at Tailings End in late 2013 which apparently had interrupted their supply for a day”. I need hardly point out that if someone had a knowingly illegal connection to our supply pipe (or SWW’s communication pipe for that matter) then it is very unlikely they would complain! 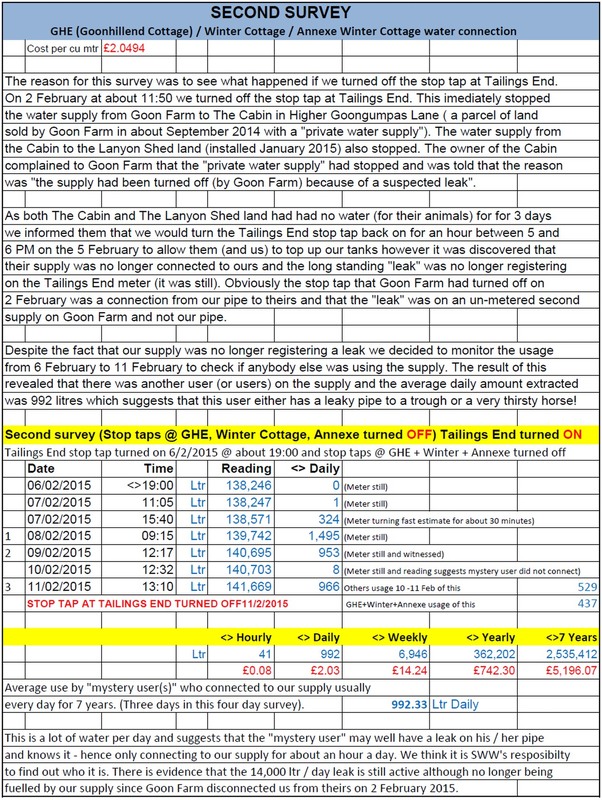 As you know we conducted a survey on SWW’s communication pipe and our private pipe crossing Goon Farm between 24 January 2015 and 31 August 2015 which revealed that Goon Farm had an illegal connection to our private pipe supplying at least two of their animal troughs and had connected the land they had recently sold (The cabin) to our private pipe who had then in turn connected that supply to their neighbour (Mr Lanyon’s tenant) and furthermore there was a serious leak (<>90,000 litres per week) on Goon Farm’s illegal connection which had been the main cause of our low / zero pressure for at least the previous 5-7 years. We informed SWW about the illegal connections as soon as we found them and provided a map showing the connections we had found (see our 30 January 2015 and 2 February 2015 emails). We requested SWW take urgent action whilst they had a chance but SWW appeared to do nothing. We later also found that Five Acres and Iona Cottage’s caravan / yard had a (presumed illegal) connection to SWW’s communication pipe and Carn View had a connection to the supply which fed their animal troughs and also one on Mr Lanyon’s land (disconnected soon after our survey began). Carn View’s connection point is uncertain in that it could be to our private pipe crossing Goon Farm or on SWW’s communication pipe. Additionally a SWW inspector (Dennis ????) told me that Tailings End’s outside tap was connected to the communication pipe. 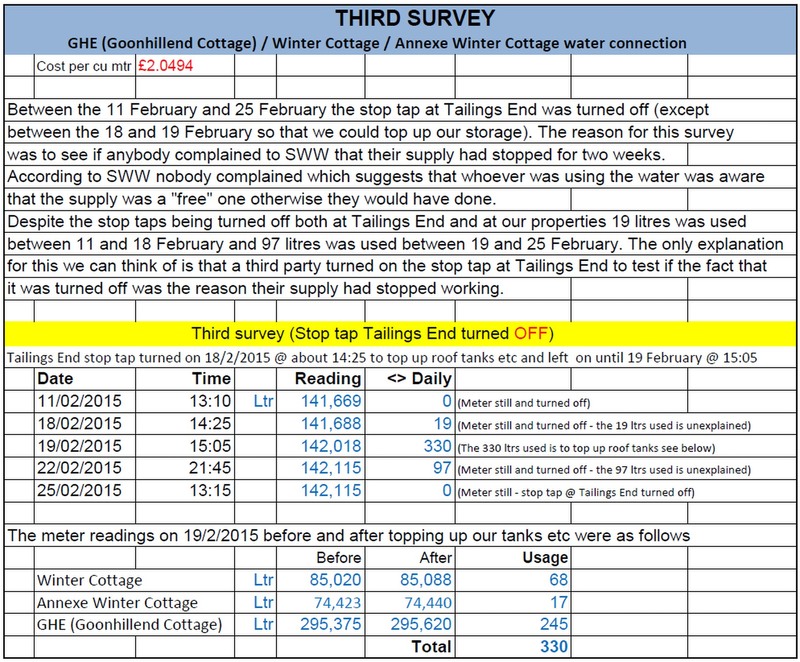 Of the <> 97,000 litres per week usage our survey revealed <> 90,000 litres was due to Goon Farm’s illegal connections and leak and was “fixed” within three days of us turning off the Tailings End stop tap on 2 February 2015 because when we turned it back on again on 5 February 2015 to allow us, The Cabin and Mr Lanyon’s tenant to replenish their water tanks it was found that Goon Farm had disconnected the illegal connection to our private pipe and the overall usage had dropped from <>97,000 litres to <>7,000 litres per week and we no longer had a low / zero pressure problem. At this point (6 February 2015) we asked SWW (Alan Brand) to take over the investigation but he refused still insisting it was a private matter despite the 7,000 litres per week was more likely to have been on the communication pipe than on Goon Farm. SWW’s refusal to take over meant that we had to complete the installation of the rainwater harvesting installation we had informed Tudor Cornish and Matt Nicks about (see our 30 January 2015 and 2 February 2015 emails) and continue our investigations until 31 August 2015 when SWW’s Mike Shannon said SWW would take over the task of continuing the survey by reading the meters (but in the event didn’t). Our actions reduced the illegal connections / leak(s) from <>97,000 litres per week to <>7,000 litres per week and eventually to virtually zero and cured our low / zero water pressure and additionally revealed serious regulation violations on other properties that had been and still could affect our water quality. At a meeting on 4 March 2016 at Goonhillend Cottage between Mike Shannon, his assistant, Mr Bellward and I there was a bit of a breakthrough as for the first time, exactly three years after we provided SWW with copy of Winter Cottages deeds in my 4 March 2013 email showing that part of our supply is private (where it crosses Goon Farm land) and part of it is a communication pipe (where it is laid in the lane) Mike Shannon admitted the first part of the pipe (<> 104 metres) was indeed a communication pipe and SWW’s responsibility, Apparently he has since said he doesn’t recollect admitting this but as I have stated several times (including my10 May 2016 draft complaint sent to Tracy Symons) he did admit this at the 4 March 2016 meeting he is challenging my word and I object. You have now stated in your 26 June 2017 letter regarding Annotation 33 (3 March 2016 email from Sarah Newton) “Document not provided to Mike Shannon” .Your 9 June 2017 letter states “As we have previously confirmed, although Mike discussed central heating systems regulations with you during his visit on 4 March 2016, no correspondence from Sarah Newton was shared with him”. I can assure you that the document from Sarah Newton was shared with Mike Shannon. As I have said previously it was handed to him at the 4 March 2016 meeting but he said he couldn’t read it as “he had not brought his reading glasses with him”. His assistant started to read it for him but Mike Shannon stopped him about half way through and called a halt to the meeting at that point. I had only received the 3 March 2016 email from Sarah Newton the day before the meeting and it is inconceivable it was not part of the admitted discussion about central heating systems at the meeting. I provided the document (and a few others) in a folder to Mike Shannon at the meeting and it is not my fault that he did not take it away with him. Finally SWW’s Dr Parry confirmed in writing in his 20 February 2017 letter to CCWater that “In the event that the pipe travels from Mr Layte’s stop tap along Lower Goongumpas Lane and within the boundary of the street then this would be a communication pipe and the responsibility of SWW”. It is a pity that Allister Symonds did not admit that back in 2013 when we provided him with a map showing the pipe to be in the lane because a vast amount of time and money (and water!) would have been saved if he had. The 4 March 2013 email to Allister Symonds has a map that clearly shows that the pipe is laid in the lane and does not enter Five Acres land at Tailings End as her 25 November 2016 letter states it does (she later confirmed this in a 7 December 2016 phone call). Surely if Tracy Symons had seen the 4 March 2013 email to Allister Symonds then she would have checked with him and obtained the original and then instructed SWW to dig up the lane to see if the map was accurate? Before boldly stating that the pipe enters Five Acres land at the Tailings End stop tap / meter. Her 25 November 2016 letter states that the first record of our complaint about water pressure and our suspicions that others were connected to our supply was 29 August 2013. Obviously this is about six months after the 4 March 2013 email to Allister Symonds suggesting that Tracy Symons did not take it into account. Her 25 November 2016 letter states “we do not know the exact path of your private supply pipe. We would however advise that such private pipes are often shown on properties’ deeds” but the 4 March 2013 email to Allister Symonds has a copy of Winter Cottage’s deeds which includes a map which shows of the exact path of the supply pipe and which parts of it are private and which are not and are SWW’s responsibility. In effect Tracy is suggesting we provide SWW with a copy of the deeds which we had already done (several times). This obviously suggests that SWW withheld a copy of the 4 March 2013 email and map from her. Do you still think Tracy took all the documents you have provided into account whilst preparing her response to my 27 October 2016 email (attaching a copy of my 10 May 2016 draft complaint)? You say Tracy Symons took all the documents you provided into account whilst researching her 25 November 2016 response to my 27 October 2016 email (attaching a copy of my 10 May 2016 draft complaint). I think it very unlikely she took the 2 February 2015 email to Tudor Cornish into account and you have now admitted she did not take the 30 January 2015 email Tudor Cornish and Matt Nicks into account. Your 9 June 2017 letter enclosed a copy of the 30 January 2015 email SWW downloaded on 8 June 2017 which is an accurate copy of the one actually sent but obviously not the original. Your 26 June 2017 letter however encloses a copy of supposedly the same email as attached to my 23 December 2016 email which indeed it was but it was not an accurate copy due to a problem with the “print to PDF” facility in Gmail under Chrome and in any case it is impossible she took an item attached to a 23 December 2016 email into account when investigating her 25 November 2016 response to my 27 October 2016 email (attaching a copy of my 10 May 2016 draft complaint) because she obviously had not seen that copy at the time. Your 26 June 2017 letter admits this by annotating item 7. 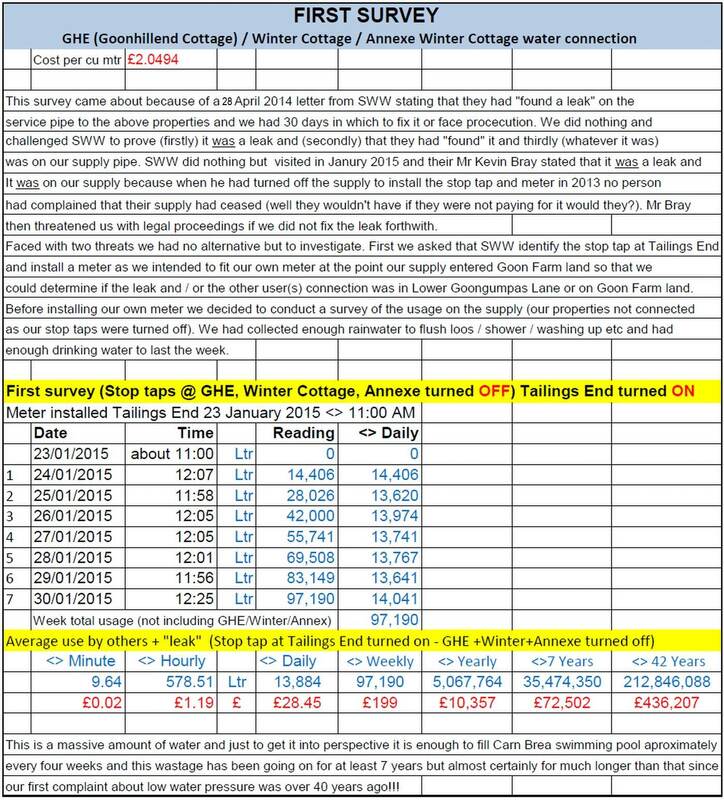 (appendix 7) with “Copy attached – attached to Mr Layte’s email sent on 23 December 2016 at 1637 – not previously seen although spreadsheet of daily meter readings was previously sent. It does not provide any new information”. Your statement is not true as it is a very important email and provided important information. Your statement “although spreadsheet of daily meter readings was previously sent”. Is also untrue - The email attaching the spreadsheet was sent at 15:32 on 30 January 2015. 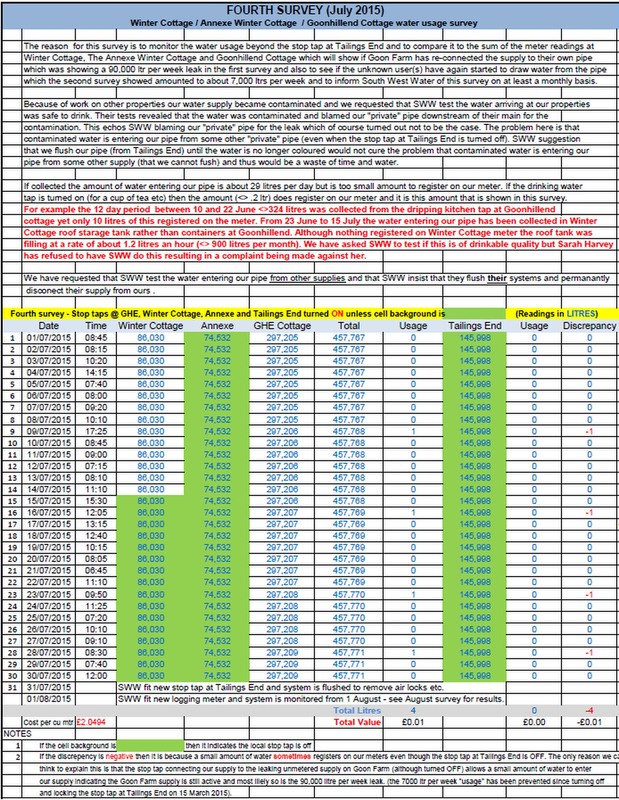 Since the last reading of the meter shown on the spreadsheet was taken at 12:25 on the same date meaning that any “previously sent” spreadsheet would have to have been sent between 12:25 and 15:32 which I think you will agree is unlikely. More important is your statement “It does not provide any new information”. This is utter nonsense - I consider this email very important indeed to the case – This email provided SWW (Tudor Cornish of SWW Leakage) with proof that there is considerable usage, almost certainly a serious leak, on the pipe (97,190 litres per week! ), one known illegal connection and one suspected one and if SWW had acted quickly then they would have caught Goon Farm “red-handed” and could as Kristian Barber says in his 14 February 2014 email ”If our investigations identify an illegal connection to your supply pipe, we will seek recompense from the user for the water used” sought recompense for at least one weeks usage (£199) but as the illegal connection and leak had been going on for about 7 years considerably more (£72,500). The email was not “followed up” and Goon Farm was not visited and the Flag Status of “completed” is untrue. The email was “followed up”, Goon Farm was visited and told to disconnect from our private pipe, connect the land that they had just sold to a legal water supply (behind their meter rather than connected to our supply), modify their non-compliant animal troughs and repair the substantial leak on their connection to our supply without telling us they had “followed up” our 2 February 2015 email and there was no need for us to continue our investigation, install a rain water harvesting system to allow us to turn off the stop tap at Tailings End, set up a web site, walk nearly 200 miles reading meters and investigating further, deal with SWW regulations team’s so called “violations” and failures, attend meetings with Mike Shannon who we all find untruthful and confrontational and so on. If it is 1. Then I need to know who it was that untruthfully set the Flag Status to “completed”? And why SWW did not investigate Goon Farm despite the evidence we had provided over the years that something on Goon Farm was causing our low / zero water pressure problem. If it is 1. then the highlighted text in Sarah Harvey’s 3 July 2015 email should be noted as should the remainder of her email. If it is 2. Then it means that SWW were aware that most of our problem of low water pressure and illegal connections had been rectified (<>90,000 litres per week) but were happy to let us continue investigating for a further 8 months to identify the other illegal connections / leaks (<>7,000 litres per week) some, if not all, of which were connected to what SWW knew was a communication pipe and not a private pipe. If it is 2. then the highlighted text in Sarah Harvey’s 3 July 2015 email should be noted as should the remainder of her email. You must answer the question – Is it 1? is it 2? or is it some other scenario that I have not thought of? (will CCWater please insist SWW answer this question). My 30 January 2015 email informed SWW of one illegal connection on Goon Farm, one suspected one on the land Goon Farm had recently sold and a 97,000 litres per week usage. My 2 February 2015 email confirmed there were now two (non-compliant) animal troughs on Goon Farm illegally connected to our supply and 2 other illegal connections to a pipe coming from Goon Farm and furthermore attached to the email was a detailed map of their positions. What more did SWW want? Surely SWW should have immediately inspected Goon Farm and dealt with the leak and illegal connections and (as above) Kristian Barber says in his 14 February 2014 email ”If our investigations identify an illegal connection to your supply pipe, we will seek recompense from the user for the water used” sought recompense for at least one weeks usage (£199) but as the illegal connection and leak had been going on for about 7 years considerably more (£72,500). The 2 February 2015 document supplied with your 9 June 2017 letter looks like this and includes a map (SWW downloaded it from www.goongumpas.com on 8 June 2017 at 10:58) whereas the one you supplied with your 26 June 2017 letter looks like this which is the same text but does not include the very important map. The 4 March 2013 document supplied with your 9 June 2017 letter looks like this and includes a map, deeds easement, 1960’s Arial photo and log of zero water pressure dates (SWW downloaded the attachments (map, easement etc from www.goongumpas.com on 8 may 2017 at 11:31 and again on 12 May 2017 at 13:40) whereas the one you supplied with your 26 June 2017 letter looks like this which is the same text but not the original as it is a forwarded copy and does not include the very important map, easement etc. 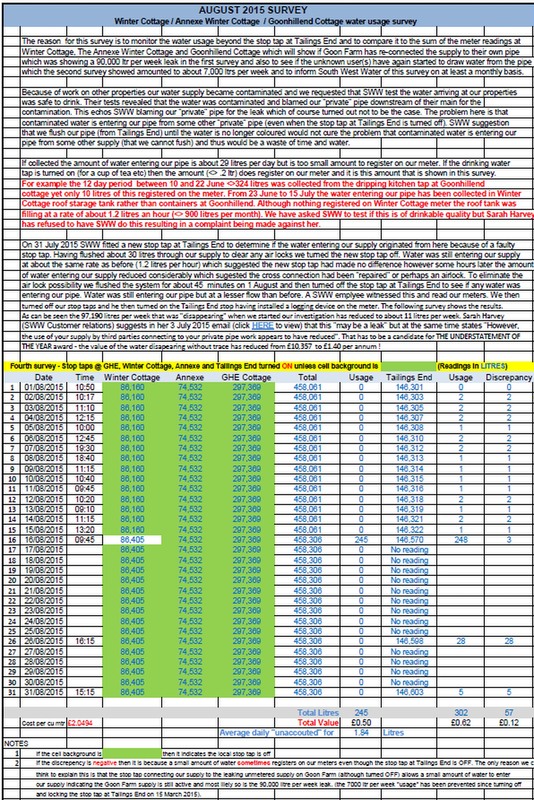 The 8 February 2015 document supplied with your 9 June 2017 letter looks like this SWW downloaded this from www.goongumpas.com on 8 June 2017 at 10:59 but did not supply a copy of any of the attachments listed (Water easement winter cottage.pdf, Survey 1.pdf, Survey 2.pdf, 28 April 2014 swwthreat.pdf and Water supply Goongumpas 3.jpg (An updated version of the map supplied with my 2 February 2015 email in light of new information discovered in the last 6 days). The one you supplied with your 26 June 2017 letter looks like this which appears a genuine version sent to your own inbox but crucially does not include any of the attachments mentioned in the Header and of course has the suspicious heading Follow Up Flag - “Follow up” and the Flag Status - “completed”. The 2014 schematic you supplied with your 26 June 2017 letter looks like this and it is obviously not a 2014 schematic as it shows Five Acres and Iona Cottage as suspected of being connected but this was not known in 2014. You say that it was included with correspondence to Mike Saldivar dated 24 February 2015 but I have no record of such correspondence (probably due to a computer crash) thank you for providing a copy (Appendix 6) as it appears to be important. However I do have a record of a 2015 schematic which was attached to my 11 February 2015 email to “The West Briton” and “Customer Leakage”. As can be seen at the time of this email we suspected that Five Acres and Iona Cottage were illegally connected to SWW’s communication pipe but SWW inspectors had not confirmed at the time however by March 2015 they had and also informed us that Tailings End outside tap was connected resulting in the schematic you provided being updated to the March 2015 one as handed to Mike Shannon. Your statement that the 2014 schematic (as handed to Alan Brand) and the 2015 schematic (as handed to Mike Shannon) are the same is not true and the one you have provided is in between the two. Did Tracy take the 11 February 2015 email into account? If so please supply an original copy from customer leakage’s inbox. Will Dr Parry please confirm he has had sight of the 11 February 2015 email because if he had then his statement in his 20 February 2017 letter to CCWater that “There is nothing connected to the water main from where the hydrant is positioned and the road which branches off to Goon Farm” is obviously untrue. The 24 April 2015 document supplied with your 9 June 2017 letter looks like this . SWW downloaded this from www.goongumpas.com on 8 June 2017 at 11:00. The email states “I forward a copy of my March 2013 email…..” but you did not supply a copy of this attachment (Water easement winter cottage.pdf) albeit you had downloaded it from www.goongumpas.com on 8 may 2017 at 11:31 and again on 12 May 2017 at 13:40. The copy of this document (Appendix 11) you supplied with your 26 June 2017 letter looks like this. 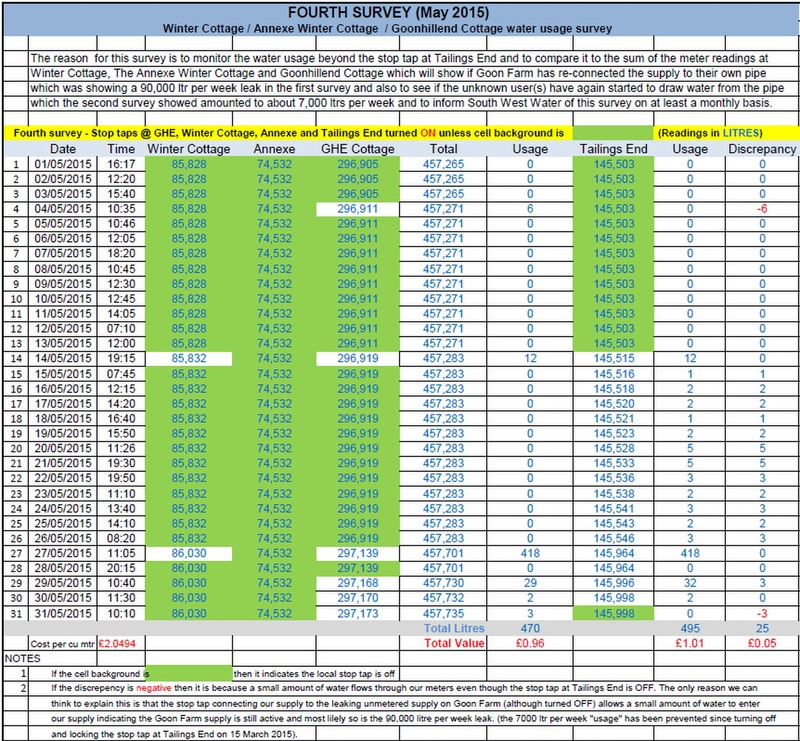 This appears a genuine copy of my email forwarded to you on 27/4 by Customer Relations (Subject DS 27/4 Fwd: Water supply ……..) but once again the all important attachment (Water easement winter cottage.pdf) mentioned in the header is not included in Appendix 11. There is quite a lot more “anomalies” between the documents enclosed with your 9 June 2017 letter and the ones enclosed with your 26 June 2017 letter. Despite your assurances (in both letters) that Tracy Symons took all the documents into account whilst researching her 25 November 2016 response to my 27 October 2016 email (attaching a copy of my 10 May 2016 draft complaint) it is obvious she couldn’t have taken all the documents enclosed with your 9 June 2017 letter into account as half of them SWW downloaded some six months after she composed her 25 November 2016 letter. As to the documents you enclosed with your 26 June 2017 letter then it is hardly surprising Tracy Symons came to the conclusion that the pipe entered Five Acres’ private land at Tailings End and did not proceed down the lane towards Goon Farm because it seems that all the maps, easements etc that showed the pipe to be in the lane were withheld from her. Mr Layte’s concerns regarding his own central heating system were clarified in detail in point 2.5 of my letter of 22 February 2017. In summary, Mr Layte’s heating system was compliant at the time of our inspections therefore no further comment or enforcement action appeared on any of the contravention notices issued to him. South West Water manages backflow risks from central heating systems in compliance with section 73 of the Water Industry Act 1991 and the Water Supply (Water Fittings) Regulations 1999. Every installer, owner or occupier, whose installation has been inspected, is treated in exactly the same way – if a breach of the Regulations is identified, a contravention notice will be issued which will require the customer to rectify the breach within agreed timescales. You attribute this statement to SWW’s Dr Parry and as you know from our 22 June 2017 phone call I am not at all happy about his statement as it is totally untrue and once again suggests he has been seriously misinformed. My complaint was that the regulation team failed to warn me of the danger in all their visits and on their last visit on 13 October 2015 (the only visit I had, by then, installed backflow prevention to the central heating header tank) SWW’s regulation Officer, Jeff Steere, stated “there was no regulation requiring me to do this” but as I thought him to be wrong I asked my MP to check and her enquiries to the relevant Government department revealed that protection is required. At the 4 March 2016 meeting with Mike Shannon mentioned in Chris Broxton’s 9 June 2017 letter I gave him a folder with about 4 documents in it. Whilst discussing Central Heating header tank regulations Mike Shannon said he did not think there were any relevant ones. I pointed out the letter in his folder from my MP Sarah Newton with the regulations and asked him to read it. He said he could not as “he had not brought his reading glasses with him”. His assistant started to read it but about half way through Mike Shannon stated “that this was not what the meeting was for” and stormed out in a huff without taking the folder with him. The statement in Chris Broxton’s 9 June 2017 letter “No correspondence from Sarah Newton was shared with him (Mike Shannon)” is not true. I have asked SWW to warn ALL their customers of the risk to their health from unprotected non-compliant (by today’s regulations) central heating header tanks and ask again that SWW do this. Also at the same 4 March 2016 meeting Mike Shannon stated that the “first part of the pipe from Tailings End to Harmony Cottage’s gate (<> 104 metres) was indeed a communication pipe and SWW’s responsibility but from there, according to Google Maps, Lower Goongumpas lane led to Harmony Cottage and not Goon Farm”. Both Mr Bellward and I disagreed as we say Lower Goongumpas lane leads to Goon Farm and Google maps is wrong to state that the part from Harmony Cottage’s gate to Harmony Cottage is Lower Goongumpas Lane. 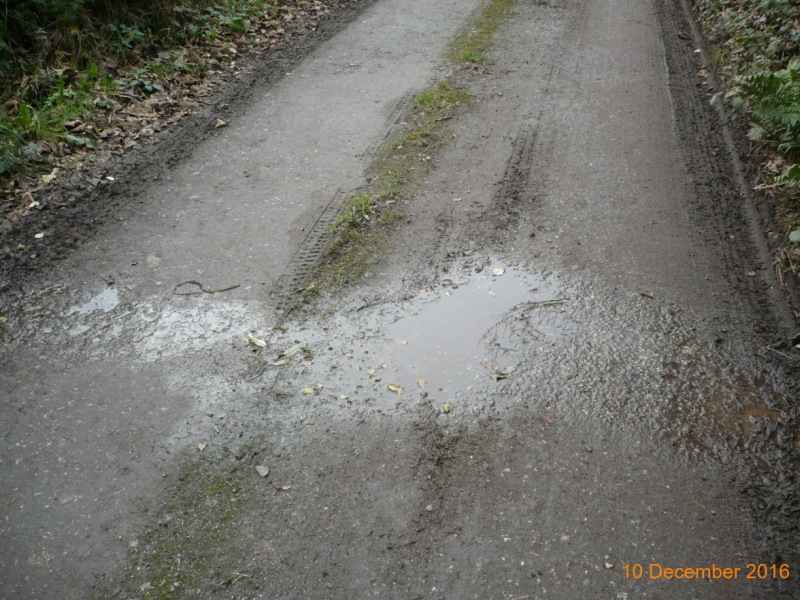 It is Harmony Cottage’s drive and a bridleway (see the photos attached to my 27 October 2016 email to Tracy Symons and my 10 May 2016 Draft complaint also attached to it ) Since then we have contacted Ordnance Survey and they agree that Lower Goongumpas Lane does not lead to Harmony Cottage. I understand from your 12 June 2017 email that Mike Shannon has no recollection of stating that the first part of the pipe in Lower Goongumpas lane is a communication pipe and obviously has decided to side with Tracy Symons who has stated in her 25 November 2016 letter (and 7 December 2016 phone call) that the pipe does not go down the lane but enters Five Acres land and crosses about five different private properties until it reaches our properties about half a mile away making the full length private. The pipe from Tailings End is a communication pipe, laid before 1989, and is SWW’s responsibility not ours. Our responsibility begins where the pipe enters private land which we maintain is Goon Farm. Tracy Symons is wrong to say the pipe enters private land at Tailings End – it doesn’t. Dr Parry is wrong to state in his 22 February 2017 letter that “The pipe from the (Tailings End) stop tap is Mr Layte’s private supply pipe” – it is not but he is correct in stating, in the same letter, “In the event that the pipe travels from Mr Layte’s stop tap along Lower Goongumpas Lane and within the boundary of the street then this would be a communication pipe and the responsibility of SWW”. The excavations prove that the pipe travels from the stop tap and meter that SWW installed (at our request) in late 2013 along Lower Goongumpas lane towards Goon Farm. The communication pipe leading to our properties from Tailings End is not the only one as Dr Parry and Tracy Symons have both admitted there is a separate pipe leading to Goon Farm and there are probably others leading to The Homestead and Wheal Maid Cottage. These pipes are SWW’s responsibility and beg the question as to why SWW installed Goon Farm’s meter at Goon Farm rather than Tailings End? Perhaps SWW are aware other properties are connected to what should be Goon Farm’s communication pipe but is in effect an extension of their main. It is interesting that Dr Parry should state “In the event that the pipe travels from Mr Layte’s stop tap along Lower Goongumpas Lane and within the boundary of the street then this would be a communication pipe and the responsibility of SWW”. In his 22 February 2017 letter because, if this is the case now then this was the case when we first reported low / zero water pressure to Allister Symonds in about 2009 / 2010. Allister Symonds should have known that it was more than likely the pipe was laid in the lane rather than than it entered private land at that point and should have checked before claiming “that SWW’s responsibility ended at Tailings End and the rest of the pipe was a private supply pipe”. Thousands of hours of work and many millions of litres of water would have been saved if he had done. Kevin Bray told us that he installed the stop tap / meter at Tailings End (in late 2013) and it must have been obvious to him that the pipe he connected to was laid in the lane and did not go through the wall to Five Acres land. Surely Tracy Symons should have checked with the person who installed the stop tap / meter as to whether the pipe entered Five Acres land or continued down the lane to Goon Farm before writing her 25 November 2016 letter ? Dr Parry is wrong to state in his 22 February 2017 letter that “There is nothing connected to the water main from where the hydrant is positioned and the road which branches off to Goon Farm”. We informed SWW that following our turning off and locking of the stop tap in March 2015 that Five Acres had to start feeding their animal troughs with yellow garden hose and Iona Cottage also had to start feeding their caravan yard (behind their property) by hose pipe. When a SWW inspector witnessed these hose pipe connections he also informed me that Tailings End was the only property to respond to SWW regarding our notice. According to SWW’s inspector Tailings End reported their outside tap had stopped working when we turned off the supply but the rest of the property was connected to a meter in the lane which he pointed out. Dr Parry is wrong to state in his 22 February 2017 letter that “Samples were taken on the 29 April 2015 from where SWW responsibility ends at Tailings End” because SWW’s responsibility does not end at Tailings End – it ends at the end of their communication pipe. The samples taken revealed slightly raised levels of contamination due (apparently) to “old pipe fittings” but were these fittings on the communication pipe or on the private part of the pipe crossing Goon Farm? Relevant samples must be taken from where the pipe enters Goon Farm land and the communication pipe replaced if the contamination is found to be on that pipe. The pipe is between 50 and 60 years old and probably due for replacement anyway. All of the letters and statements made by SWW that their responsibility “ends at Tailings End” and from there it is a “private” pipe can now be said to be untrue. There are many such letters and statements made over the years. Dr Parry’s 22 February 2017 letter has 12 mentions of the word “private” in it for instance. The reason SWW gave for refusing to pay our invoices was because “we were working on a private pipe” is not acceptable as most of the time we were working on theirs - one could say as their subcontractor following their 28 April 2014 letter threatening litigation if we did not fix the problem. Since we fixed the problem we will re-submit our invoices and add one for installing an utterly pointless check valve at Goonhillend and also for excavating the communication pipe on 20 June 2017. All decisions made by CCWater based on SWW’s false statements that the total length of the pipe from Tailings End is a private supply pipe must be re-opened and re-examined. CCWater ref 140206 000083 being one of them – see 11 April 2014 email from Brendan Green. Dr Parry, in his 22 February 2017 letter, mentions another – “On 15 October 2015 CCWater (Neil Whiteman) closed its case on Mr Layte as it was a private issue and had exhausted the complaints procedure. 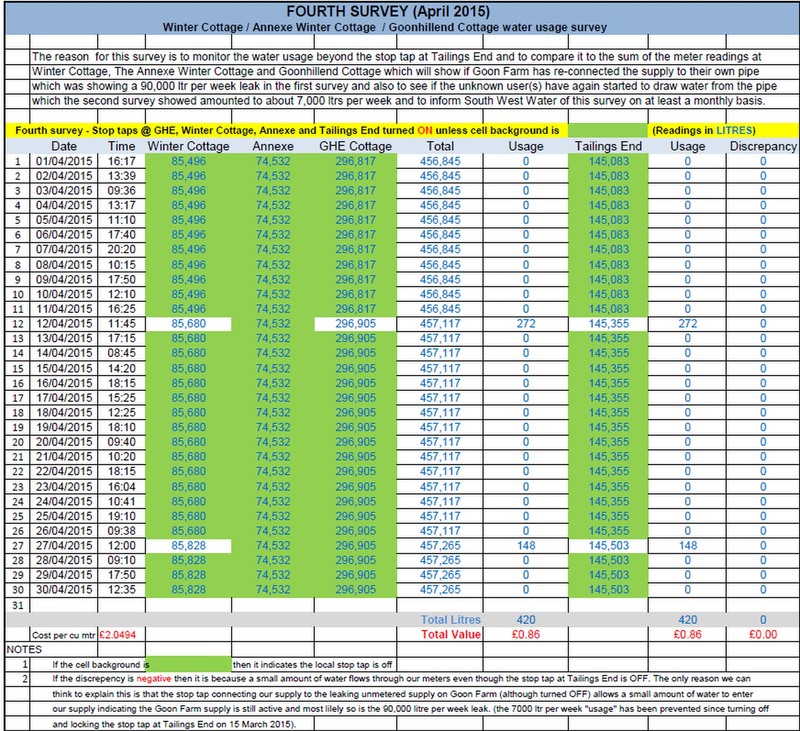 Please see email exchange dated 15 October 2015 attached (Appendix 1)”. I do not have a copy of this email (possibly because it was lost in one of the computer crashes I had at the time) so would be grateful if CCWater would send me a copy. Kristian Barber’s 14 February 2014 email is interesting in that it contains the following statement – “In regards to the suspected illegal connection to your supply pipe, this would be a private issue as South West Water has no jurisdiction regarding customer supply pipes. If our investigations identify an illegal connection to your supply pipe, we will seek recompense from the user for the water used however we would not be able disconnect them from the private supply pipe”. Presumably SWW sought recompense for the 90,000 litres (£184) per week usage we discovered on Goon Farm’s land which had been going on for at least 7 years (£72,000) and the 7,000 litres (£14) per week usage by Five Acres, Iona Cottage’s caravan, Carn View and Tailings End’s outside tap. Goon Farm’s connection was on our private pipe and has been dealt with. Five Acres, Iona Cottage and Tailings End connections are on SWW’s communication pipe and must be removed by SWW as we cannot tamper with their pipe ourselves. Carn View’s connection may be on the private pipe crossing Goon Farm but could be on the communication pipe. Once SWW have replaced the communication pipe we will know which. A stop tap / meter must be installed on Goon Farm’s boundary so that we will know if Goon Farm and possibly Carn View start using our supply again. It is about 7 years since Allister Symonds first stated that SWW’s responsibility ended at Tailings End and in that time we have had to put up with low / zero water pressure, polluted water and spent a great deal of time and money investigating and, ultimately, resolving most of the problems. Because of our efforts we have saved SWW millions of litres of wasted water. SWW should have installed the stop tap / meter on the edge of Goon Farm’s land (as we had asked see map on www.goongumpas.com and the map attached to my 27 October 2016 email). This would have revealed the substantial leak (90,000 litres per week) on Goon Farm land which we could have dealt with quickly and easily as a genuinely private issue at the time but of course the connections on the communication pipe in Lower Goongumpas Lane (7,000 litres per week) would not have been revealed. There is little doubt that the animal troughs on Five Acres land and the feed to Iona Cottage’s caravan / yard are connected to the communication pipe in Lower Goongumpas Lane. These animal troughs are non-compliant and although currently being fed by hosepipe the possibility that that the connection to the communication pipe could be turned back on at any time exists. If the connection(s) were turned back on then the chances of polluted water back flowing into the pipe which ultimately feeds our properties is high. We repeat our request for SWW to replace their communication pipe and permanently disconnect all properties connected to it and to install a meter on the boundary of Goon Farm so that we can monitor if Goon Farm (and possibly Carn View) re-connect to our “free” supply rather than feed their animal troughs from behind their meter. What SWW can learn from this affair is to admit to their responsibility for communication pipes from the beginning and what CCWater can learn is to question any future SWW claim that a pipe laid in the road is a “private” pipe. 28 April 2014 letter from SWW threatening all three of us with litigation if we did not fix the leak. In our phone call on Wednesday 7 December I told you that I am in the process of writing a reply to your 25 November 2016 letter (copy attached) and guessed (wrongly!) that it would be about a week before it is ready for publication. I offered you a chance to discuss it at a meeting or over the phone before publicizing it but you declined. As I said there is a great deal in your letter that I disagree with and I think I can prove most, if not all, of your arguments to be nonsense and there are a couple of parts of your letter that I take exception to. 1. Kevin Bray (SWW) told us that the pipe continues down the lane towards Goon Farm when he installed the stop tap and meter in late 2013 (at our request) and a logging meter in February 2014 (again at our request). He re-installed a standard meter on 23 January 2015 (once more at our request) so that we could monitor the usage and try and find/repair the alleged leak that SWW had said they had “found” a year (and five million litres of water wasted) previously. 2. Mike Shannon (SWW) told Mr Bellward and I (at our 4 March 2016 meeting) that the pipe continues down the lane and is a communication pipe until it reaches the entrance to Harmony Cottage where it enters a different lane leading to Goon Farm and ceases to be a communication pipe at that point. As you know we disagree that it is a different lane and have provided proof. 3. The meter at the bottom of the chamber is aligned with the road and not at right angles to it. 4. According to a SWW officer Tailings End reported their outside tap was connected to the pipe beyond the meter and it seems very unlikely the connection would be across the lane on private land rather than in the lane. 5. The 1970 deeds of Winter Cottage include a map that shows the pipe to be in the lane from Tailings End until it enters Goon Farm land. For the part that crosses Goon Farm there is an easement in the deeds to repair or replace that part of the pipe. There is obviously not an easement to repair or replace the pipe in the lane as it is a communication pipe in a highway laid before 1 September 1989 and SWW’s responsibility. We sent a copy of this map and easement to various SWW employees and others several times. The first time as an attachment to our 4 March 2013 (11:55) email to Allister Symonds which was sent soon after we discovered these documents in the deeds. It is apparent from your letter that you have not seen this email since you state in your letter “We do not know the exact path of your private pipe” (the deeds map shows the exact path of the pipe and which parts are private and which parts are not) and later you say the “first record SWW have of our complaint was 29 August 2013” which is of course about 6 months after our 4 March 2013 email proving you have not seen it. 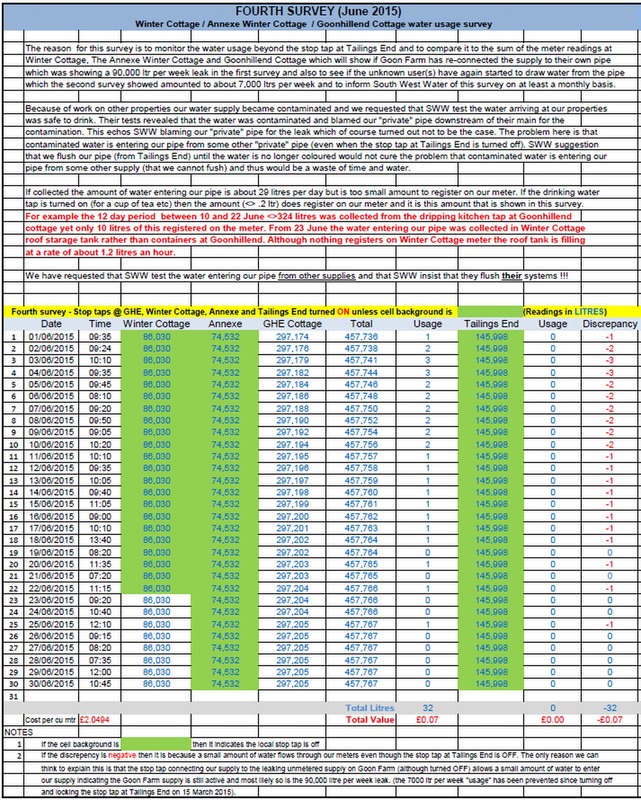 A map of the area and the “the exact path” of the pipe is also shown on the web site www.goongumpas.com which I understand SWW has looked at many times (the last logged visit being on 19 December 2016 at 11:57 see attached log of the last 10 months for one of the SWW users). Incidentally I do not have a copy of the 29 August 2013 communication you mention which could be because it was lost in one of our many computer crashes experienced between late 2015 and June 2016 or it could be that you are mistaken. Please email me a copy. · What you are saying is Fig 2 (alternative scenario) applies. 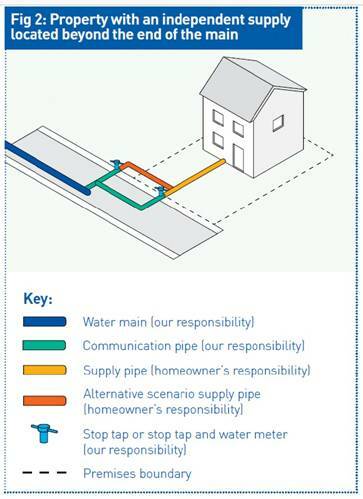 · What we are saying is Fig 2 (communication pipe in road) applies. · What Mr Shannon is saying is Fig 3 (property fronting a street where there is no main) applies. 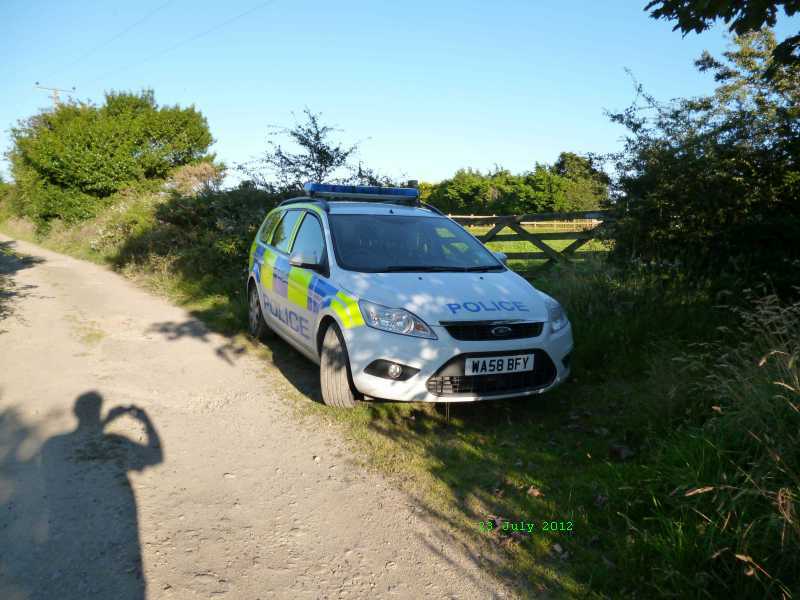 · What Mr Bray said was the pipe is in the road but it is a private pipe. Maybe he was not aware that this pipe was laid prior to 1st September 1989. In your 25 November 2016 letter (attached) you say it is not normal practice to install meters where SWW installed ours (adjacent to our properties rather than near your main half a mile away). However you did the same on Goon Farm (despite your letter stating you know their supply comes from Tailings End). For Harmony Cottage you installed their first meter on Goon Farm’s land (next to Goon Farm’s own meter apparently) so it would appear that it is the normal practice in this area. We believe this practice is the primary cause of all the trouble and expense we, Carn View / Harmony Cottage and indeed SWW have had. SWW installed all these meters without first testing the quality of the water or the integrity of the pipe leading to them. The water could have come from anywhere! In our case SWW knew our water came from the Tailings End main (we didn’t because we had not seen the Winter Cottage deeds at the time). If SWW had spent a couple of hours installing a stop tap and meter on “our” pipe at Tailings End before installing our meters then hundreds of thousands of pounds as well as millions of litres of water would have been saved because the leak and the other connected users (Goon Farm’s troughs, Carn View, Harmony Cottage, Carn View’s trough on Mr Lanyon’s land, the stand pipe on the land Goon Farm had for sale (sold in 2014 and now known as The Cabin), Five Acres , Tailings End’s outside tap and Iona Cottage’s caravan yard. Would have been found and dealt with eight+ years ago and we, Carn View and Harmony Cottage would not have complained of low pressure because the connected cattle troughs and leak on Goon Farm would have been fixed and the pressure would no longer have been low (or zero for about an hour per day for eight years for us). Harmony Cottage and Carn View would probably not have needed to install new pipes to Tailings End and saved the considerable expense of doing this. I say probably because both Carn View and Harmony Cottage (as well as our own properties) were all sold by Goon Farm with a water supply connected to ours (I cannot see that their deeds would include another easement over the same pipe as our deeds do from the same vendor and Winter Cottage was the first property Goon Farm sold back in 1970). Further if SWW had tested the quality of the water it is almost certain they would have found the water was polluted by backflow from the many non-compliant animal troughs on Goon Farm and elsewhere between Tailings End and our properties. As Mr Bellward says in his 10 December 2016 letter (copy attached) he blames these troughs for the diarrhoea he suffered for years before he stopped using your water in the summer of 2015. I agree with him and have not used your water for drinking since then. 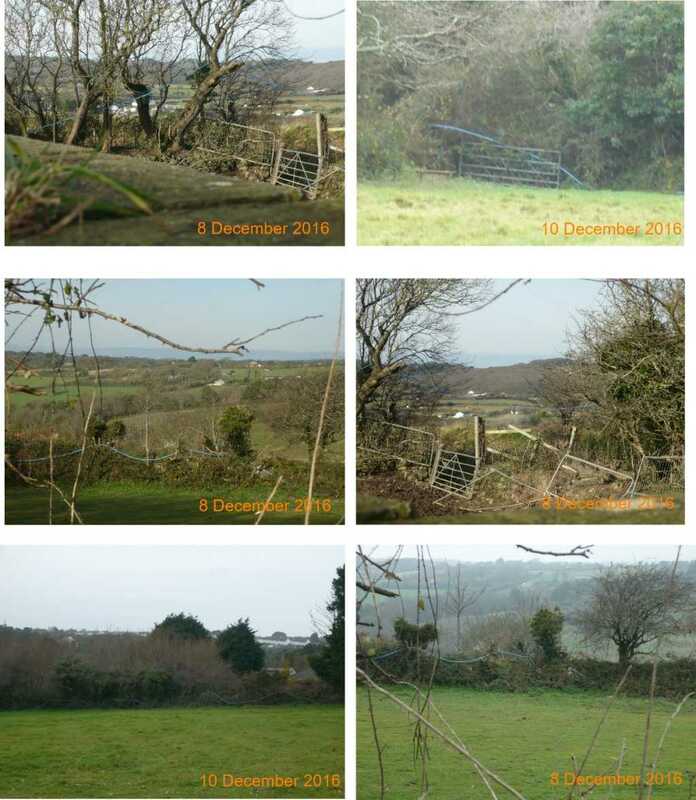 I have asked SWW several times to confirm all animal troughs in the area to be certified as compliant before we trust your mains supply for drinking purposes and as yet I have not had a reply and as you can see from the attached 6 December 2016 photos two of the troughs connected to our supply in January 2015 (which SWW were informed about at the time (see 30 January 2015 and 2 February 2015 emails to Tudor Cornish and Matt Nicks) are still non-compliant and connected to a live supply nearly two years after we informed SWW about them. I have not yet checked the dozens of others in the area. Your letter states “Our Water Regulations team have undertaken a thorough check of the wider area to ensure there are no other potential sources of contamination. Some issues have been identified and the Regulations Officers are working with the property owners to rectify these. None of the non compliances identified in the wider area would have any impact on the supply to your property”. For your information these two animal troughs are still non-compliant because they have no backflow prevention, no visible double check valves, no frost protection and little float valve protection to prevent animal damage furthermore they are full of category 5 fluid consisting of mains water + rainwater, + algae, + animal saliva / urine + organic matter such as dead leaves + dead insects + goodness knows what else! To say that they don’t pose a risk of contaminating your supply (and hence ours) is ridiculous and even if (note if) they are now no longer connected directly to our supply they had been for many years almost certainly polluting our drinking water because a prerequisite for water to backflow is for the supply pressure to drop to zero and lead to the water in the trough to syphon back into the supply pipe. Whereas zero pressure is very rare remember our supply dropped to zero for eight years for about an hour per day hence our main complaint. I think your regulations team have rather got their priorities wrong considering the dozens of letters, several inspections, SWW staff involved in getting me to permanently disconnect a (turned off anyway) very difficult to access mains connection to the covered rainwater distribution tank in the dark (less algae) roof at Goonhillend filled with 5 stage filtered rainwater. SWW’s notice required me to disconnect this mains connection within 7 days yet do nothing for nearly 2 years about these far more dangerous troughs! I believe SWW should amend their policies as to where meters are installed but if they are installed a long way from the main then the quality of the water as well as the integrity of the supply to the meter MUST be tested first to avoid a repeat of this very expensive for all involved (including SWW) incident. Your 25 November 2016 letter states “I can assure you that my review of your complaint has been extremely thorough and I have considered all the information you have presented”. I am afraid I cannot agree with you as it is very apparent from your letter that you have not taken into account important documents pertinent to my complaint and this case. The (considered very important) 4 March 2013 email mentioned above you have obviously not considered for instance. This may be that you have ignored them or they have been deliberately withheld from you or “lost” by the recipients so before supplying you with the remainder of this letter will you please confirm you have had sight of the following documents by emailing me copies. Thank you in anticipation. 2. 4 March 2013 (11:55) email to Allister Symonds. This email mentions that Goon Farm’s owner has stated that Goon Farm is now on a metered supply and the stand pipe on the land they had for sale (see above) was legal and fed from behind Goon Farm’s new meter. Goon Farm sold the land in 2014 and it became known as “The Cabin”. The water supply sold with it was not legal and was connected to our supply as we suspected. The buyer’s solicitor did not check whether the supply was legal and it was one of the water supplies we found to be connected to ours in January 2015 when we started our survey (see www.goongumpas.com ). If only Allister Symonds had done as we asked and checked this supply and the troughs on Goon Farm then I would not be writing this now L.
3. 6 February 2014 (15:07) email to Brendon Green (CCwater), Ofwat, Customer Contact (SWW), T.Ludkin (SWW). A copy of the 4 March 2014 (15:07) email to Allister Symonds was attached to this email. 4. 14 February 2014 (11:21) email from Kristian Barber (SWW) to john@layte.com Important. 5. 28 April 2014 Notice to repair a leak SWW stating (wrongly) that they have found. Posted to occupiers of Winter Cottage, Goonhillend and The Annexe Winter Cottage. Now considered “An incorrect Notice” according to your 25 November 2015 letter (attached). It is noted your letter states the £1,500 compensation offered was because of this “incorrect Notice” but if that were the case why was it (and is now in your letter) being offered to only one of the 3 recipients? 6. Goon Farm pipework schematic (2014) handed to Alan Brand on one of his visits. Important. 7. 30 Jan 2015 (15:32) email to Tudor Cornish and Matt Nicks. Very important. 8. 2 February 2015 (16:14) email to Tudor Cornish. Very important. 9. 8 February 2015 (18:48) email to Gwynne Parker Price (Carn View owner), Alister Symonds (SWW), Customer Contact (SWW), T.Ludkin (SWW), Ofwat, Sarah Newton (MP), J.Reins (West Briton), Jaqui Walls (DC Media).A copy of the Winter Cottage Deeds map showing water supply from Tailings End in the lane, across goon farm land to Winter Cottage (with a copy of the easement for the private part) was attached to this email at Gwynne Parker Price’s request. 10. 16 April 2015 letter from Richard Harrison to Mr Layte. Lists “violations” regarding the rainwater harvesting system at Goonhillend only one of which had any merit but he should have been concentrating on real, dangerous to public health, violations from the non-compliant troughs on Goon Farm that we pointed out to him as well as others in the area. As mentioned above two of these troughs are still non-compliant (see photos) and there are probably many others in the area. 11. 24 April 2015 (16:24) email to Customer Leakage (SWW) Sarah Harvey (SWW), Ofwat, Sarah Newton (MP), J.Reines (West Briton), Devon and Cornwall Police. A copy of the 4 March 2014 (15:07) email to Allister Symonds was attached to this email. 12. Goon Farm pipework schematic (March 2015) handed to Mike Shannon on one of his visits. Important. This is a slightly updated version of the one handed to Alan Brand in 2014 in the light of new information. 13. 8 May 2015 email to Sarah Harvey (SWW), Customer Leakage (SWW), Ofwat, CCwater, Sarah Newton (MP), J Reines (West Briton). Important. 14. 9 June 2015 email to Sarah Harvey (SWW), Customer Relations (SWW), Customer Leakage (SWW), CCwater, Offwat, Sarah Newton (MP), J Reines (West Briton). Important. 15. 3 July 2015 (09:29) email from Sara Harvey (SWW) to toplaner@goongumpas (J.Layte, K Layte and Gavin Bellward). Important. 16. 8 July 2015 (1st) letter from Richard Harrison to Mr Layte. This letter suggests there is a category 3 risk of backflow from the downstairs shower tray and the upstairs bath taps because they are connected to the mains and gives 28 days to comply with the regulations!!!!!!!!!!! But they are not connected to the mains - both hot and cold are gravity fed from the rainwater roof tank which admittedly was at the time was still connected to the mains with the turned off supply whilst a way of disconnecting it was being contemplated but even so water cannot defy gravity and get to the roof tank which I would have thought a 6 year old would know but Richard Harrison is a SWW Regulations officer! These “violations” are numbered 3 and 4 in his letter. I do not know what 1 and 2 are as that page is missing. 17. 8 July 2015 (2nd) letter from Richard Harrison to Mr Layte. This letter contained “violations” 2 and 3 but dated April 2015 not July. By July violation 2 (marking pipework) had been done and violation 3 requiring permanent removal of mains connection to the rainwater roof tank was being contemplated but was not completed until September due to its complexity because of access problems. 18. 17 July 2015 (16:48) email (17 July letter to Sarah Harvey attached), Customer Leakage (SWW), Ofwat, Sarah Newton (MP), J.Reines (West Briton), CCwater, Devon and Cornwall Police. Important. 19. 7 August 2015 letter from Robert Goulden to Mr Layte. This letter claims that SWW first became aware of the rainwater harvesting system at Goonhillend “Following involvement in another matter at your premises and details were passed to the Water Regulations Department in April 2015”. For the record my 30 January 2015 (15:32) email to Tudor Cornish (SWW) and Mark Nicks (SWW) gives details of the rainwater harvesting system both current and intended and it is not my fault that these details were not passed to the Water Regulations Department in January 2015. 20. 17 August 2015 letter from Robert Goulden (SWW) to Mr Layte. Important. 21. 25 August 2015 letter from E. Hough (for the Company Solicitor Pennon Group PLC ) to Mr Layte. Important. 22. 3 September 2015 letter from Mark Baker to Mr Layte. Important. 23. 7 September 2015 (11:30) email to Robert Goulden (SWW), Customer Leakage (SWW), Sarah Newton (MP), Sarah Harvey (SWW), CCwater, Customer Relations (SWW), Allister Symonds (SWW), Devon and Cornwall Police. This email is one of several that attaches a diagram of a compliant animal trough and a request that SWW confirm that all animal troughs in the area comply. As can be seen from the attached 6 December 2016 photo at least two of them don’t 15 months after this request. very important. 24. 14 September 2015 (16:51) email from Mike Shannon (SWW) to Toplaner@Goongumpas (J.L) containing the text “As you have previously requested I am also copying Mrs Layte and Mr Bellward into this email” but as can be seen they were not. See 1 December 2015 email from Chris Broxton bellow. This email mentions our concerns about non-compliant animal troughs in the area and states “there is no evidence currently available to confirm this” Which of course is bunkum as Richard Harrison and two other SWW inspectors had been shown two such animal troughs at least six months previous to this and Richard Harrison had declared two of them non-compliant and pointed out a third (which we were not aware of) as also non-compliant. Important. 26. 11 October 2015 (23:17) email J.Layte’s 9 October response to Paul Mitchell’s 22 September 2015 letter copied to numerous recipients including David Cameron (PM). Sarah Newton (MP). Christopher Loughlin (SWW), Robert Goulden (SWW), Mark Baker (SWW), Alister Symonds (SWW), Customer Relations (SWW), customerleakage (SWW), Jeff Steere (SWW), Devon and Cornwall Police, mailbox@ofwat, Spotlight (BBC), J Reienes (West Briton), + a request to forward to Paul Mitchel as his letter has no email address. Very important. 27. 12 October 2015 (08:51) Due to reports that the above 11 October 2015 email had not arrived a second copy was sent on 12 October 2015 (08:51) to the same recipients. As above very important. 28. 19 October 2015 letter from Chris Broxton (SWW) to Mr Layte. 29. 1 December 2015 email from Chris Broxton to Mrs Layte and Mr Bellward finally supplying them with a copy of Mr Shannon’s 14 September 2015 email that states they were copied into it but they were not. 30. 2 December 2015 letter from Chris Broxon to Mr Layte. 31. 15 February 2016 (12:06) email from Mike Shannon to J.Layte. 32. 25 February 2016 (10:23) email from Sarah Newton to Customer Relations (SWW) FAO SWW Chief Executive – Dr Stephen Bird. (this email attached a chronology we had provided Sarah with) Important. 33. 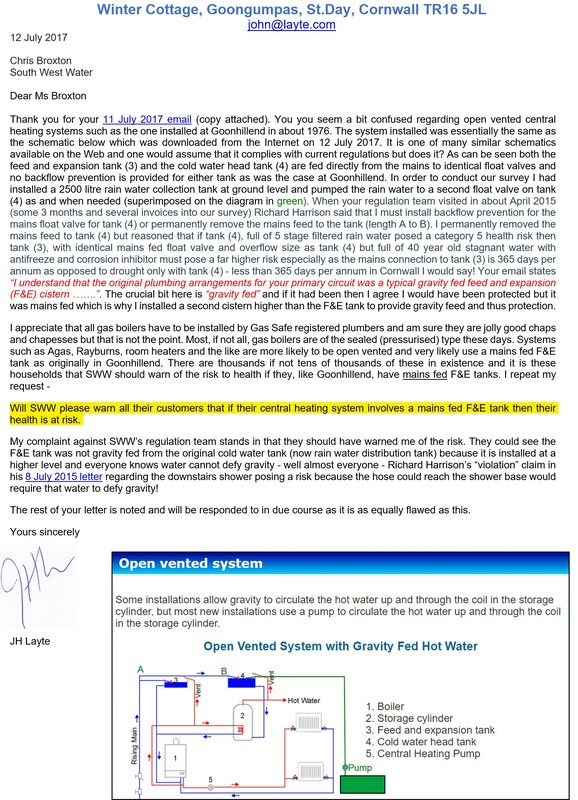 3 March 2016 (09:45) email from Sarah Newton (MP) to J.Layte which includes a letter detailing the Government’s view on backflow prevention regulations pertaining to central heating header/expansion tanks. A copy of this email was presented to Mike Shannon at our 4 March 2016 meeting as I thought it important as regards to your Regulations Officer Richard Harrison’s failure to warn me of the risk of backflow from this tank at Goonhillend and Jeff Steere’s statement at the 13 October 2015 meeting that my installing a backflow prevention to this tank was unnecessary as there were no Regulations requiring it. Mike Shannon did not read the Government’s regulation as he said “he had not brought his reading glasses with him”. His colleague started to read it to him but Mike Shannon interrupted before he reached the part of it regarding Central heating header tanks stating it was “unimportant and nothing to do with the purpose of the meeting”. He ended the meeting at that point and was clearly annoyed that Mrs Layte had been unable to attend. He left without taking a copy of the file I had prepared for him (which included a copy of this email) meaning you will not have had a copy when considering my complaint regarding this so I have attached a copy to this email for your perusal. 34. 22 March 2016 letter from Dr Stephen Bird (SWW) to Sarah Harvey (MP) relating to this case (albeit a rather distant relation!). Ill-informed nonsense and I will be writing to him after Christmas pointing out his mistakes. Interestingly Dr Bird states “We have already informed Mr Layte that the Waste Water notice (28 April 2014 above) was correctly issued” whereas your 25 November 2016 letter (attached) states that it was “incorrectly issued”. 35. 4 April 2016 (14:30) email from yourself to toplaner@goongumpas (me), Kath Layte and Gavin Bellward confirming a meeting is required with Mr Bellward, Kath Layte and myself attending to discuss compensation being paid to all three of us as you sent the 28 April 2014 Notice (now described as an “incorrect Notice” in your 25 November 2016 letter) to all three of us yet offered the £1,500 compensation only to me to conclude this matter. Note you refused my request for a meeting in our phone call of 7 December 2016. 36. 4 April 2016 (14:30) email from Chris Broxton (SWW) to toplaner@goongumpas (me), Kath Layte and Gavin Bellward confirming a meeting is required with Mr Bellward, Kath Layte and myself attending to discuss compensation being paid to all three of us as you sent the 28 April 2014 Notice (now described as an “incorrect Notice” in your 25 November 2016 letter) to all three of us yet offered the £1,500 compensation only to me to conclude this matter. Note you refused my request for a meeting in our phone call of 7 December 2016.This email appears identical and was sent at an identical time as the above one from yourself but was apparently sent by Chris Broxton. Did he send this or did you send it on his behalf? The above may not be a complete list because of the many computer crashes I experienced during mid 2015 to about August 2016 in which some documents were lost. As I said above the 29 August 2013 communication from me is an example and if you have any other documents not mentioned above I would be grateful if you would email me copies for my records. There is one document you will not have had sight of which relates to my 10 May 2016 complaint regarding your Regulations Team’s failure to warn me about the very real backflow danger from the central heating header tank at Goonhillend. SWW’s regulations officer’s failure to identify a serious backflow risk from the central heating header / expansion tank in the roof at Goonhillend and their statement that the newly installed backflow protection was “unnecessary and not required by the Government”. It is noted that your 25 November 2016 response to my 10 May 2016 complaint makes no reference to this part of it. This tank had identical mains connections /overflow size to the rainwater distribution tank except that it was connected 24/7/365 to your mains as opposed to turned off unless in case of drought (somewhat rare in Cornwall) as was the case with the rainwater distribution tank. The fluid in this tank (40 year old stagnant water containing antifreeze and corrosion inhibiter additives with some kind of slime on the surface) was far more noxious than the 5 stage filtered rainwater in the rainwater distribution tank yet your regulations team ignored it. When your Regulations team inspected on 13 October 2016 and asked what the small backflow prevention tank in the roof was for I explained that it was backflow prevention to the central heating header / expansion tank and although it was one of their suggestions for backflow prevention for the rainwater tank it was nothing to do with that tank and was not connected to it and they were here to confirm I had disconnected the mains connection from the rainwater tank (which I had), installed a pointless double check valve (which I had) and installed the utterly pointless recommendations to the “violations“ to the downstairs shower and upstairs bath as per Richard Harrison’s 8 July 2015 letter (which I hadn’t as they were not violations). Your Regulations officer Jeff Steere stated that there was no need for me to have installed such a backflow prevention device as there was no regulation requiring this. I was surprised about this as common sense suggested there should be and asked my MP to check. I attach a copy of the response she received from The House of Commons Library, Policy Specialist (Environment), Science & Environment Section and have highlighted the relevant sentences. As you can see your regulations team and the Government disagree on this and I believe SWW must address this issue. When I showed Mike Shannon this letter at our 4 March 2016 meeting he didn’t want to know, made the excuse that he could not read it as he had not brought his reading glasses with him and declined to take a copy away for later perusal which is why you will not have had a copy to refer to when considering my complaint. I have attached a copy. What are SWW going to do about the very real risk of backflow from central heating header tanks? Goonhillend is now protected but is any other property in your whole area that installed such tanks before the current regulations came into force? Shouldn’t all your customers be warned of the risk? I realize this may be a can of worms but the lid has been lifted because your Regulations Team concentrated on one tank whilst ignoring the other central heating header tank that had identical mains connections and overflow but considerably higher risk of backflow (I will not explain why in this letter but your Regulations Team should know why). Now that this can of worms has been opened I think that SWW (and probably all other water authorities) must do something about it to safeguard their customers. There are many more pages of this letter that I could email now but the Christmas period is coming up so I will not do so until January and in any case the rest of the letter is mainly details of my complaints against various SWW employees and not so important as the points raised in this part of the letter so it may be that I decide to send the rest of this letter as separate communications to be considered in conjunction with it. This will give SWW a chance to prove that the pipe after the Tailings End meter enters Five Acres private land (as you say it does) as opposed to our view that it goes down the lane towards Goon Farm and is thus a communication pipe and SWW’s responsibility. It will also give you, Tracy, a chance to prove that your 25 November 2016 letter was written having regard to the evidence listed above but I have to say I will consider your response to my complaint to be null and void if you cannot supply me with a copy of all the documents listed (except the ones marked as attached). I think the only way SWW can prove the supply pipe enters Five Acres private land at Tailings End is to dig up the lane and see if it does and while you are about it investigate what appears to be a leak (see attached photo) further down the lane towards Goon Farm. If it is a leak then it is not on “our” pipe as we have recently tested it which reveals the weekly flow to be zero – quite an improvement on 97,190 ltrs I think you will agree J. It would be interesting if it proves to be a leak and if it were on, say, the pipe leading to Goon Farm and Goon Farm complain of low pressure. Would you install a meter at Tailings End on Goon Farm’s pipe and send a Notice claiming to have “found a leak on the private pipe leading to Goon Farm” giving them 30 days to fix it (as you did with us)? Or would you concede it is a communication pipe and SWW’s responsibility to repair? Obviously someone is going to have to dig up the lane to see if you are right (the pipe enters Five Acres land) or we, Mike Shannon , Kevin Bray and Winter Cottage deeds map is right (the pipe goes down the lane towards Goon Farm). I need hardly point out that if we are right then every single letter that claims that All the pipe from Tailings End to our properties is a private pipe will become invalid in an instant. This whole fiasco has cost a vast amount of money both to SWW and ourselves and to a lesser extent Carn View and Harmony Cottage (for installing (probably) unnecessary new pipes from Tailings End) and the prime cause is your policy of installing meters far from your mains without testing the integrity and wholesomeness of the supply to the meter. However, the costs started mounting up hugely when Allister Symonds became involved when we, Harmony Cottage and Carn View complained of low /zero water pressure he should have spent a couple of hours investigating and another couple of hours installing a meter at Tailings End on our joint supply pipe which would have revealed the massive leak on Goon Farm and the non-compliant animal troughs polluting our water too. Instead he advised us that it was a private pipe from Tailings End (questionable I think) and we should all install new pipes to Tailings End (they did we didn’t). A third chance came when Allan Brand became involved in 2013. He did install a meter (at our insistence) which revealed the leak but other than sending us a notice blaming our “private” pipe in the hope that we would do something about it another year and 5,000,000 ltrs of wasted water went by before we did do something about it. It took us about 3 days to find out the main cause - 90,000 ltr per week wastage due to a leak on Goon Farm that had been going on for years. At this point (February 2015) SWW should have taken over the investigation but Alan Brand did not. It took us another 7 months to get the remaining 7,000 ltrs per week stopped by the simple expedient of installing a rainwater harvesting system to tide us by whilst we turned off the supply at Tailings End to see if anyone complained to SWW that their supply had stopped. Only one did. All the others modified their pipework , disconnected from our supply and connected to another. In order to do this (other than install a rainwater harvesting system) we had to deal with several visits from SWW leakage officers and show them around the area (connected troughs etc), several visits from your regulations team concerning a very minor violation regarding our rainwater harvesting tank (very minor compared to other violations in the area that our investigations revealed and which are still extant two years later), walking nearly two hundred miles reading meters and investigating pipework in the wider area, installing a totally unnecessary double check valve at Goonhillend and so on. It is difficult to say how many hours it has taken us to achieve this result but even this letter has taken about three weeks to write and all the others took many hundreds of hours. The installation of the rainwater harvesting system took about 100 hours and the installation of the pointless double check valve two days. The new pipe to the roof at Goonhillend to feed the central heating header tank was needed as the old pipe to the roof had to be disconnected because of your regulation teams insistence took three weeks as it necessitated cutting a 1 metre sized hole in the stone gable end of the cottage and feeding it under the bath (very awkward!) then to the central heating header tank. Half a day spent with Mr Bellward’s father attending a meeting with my (and his son’s) MP Sarah Harvey concerning our distrust of our water supply and the legality of central heating header tanks. 3 weeks setting up a website (www.goongumpas.com) which we think was the best way to advertised the fact that the supply was being monitored and the results published for all to see. At least a further 3 weeks in total uploading the readings on a daily basis. In all I have probably spent more than 1400 hours which is time I should have spent working on Winter Cottage to get it up to standard to market. We have recently (nearly) finished it and put it on the market but this could have been done six to nine months ago if it were not for all the time spent dealing with your problem. Mr Bellward and Mrs Layte also spent quite a bit of time investigating, reading meters etc. Mr Bellward’s father has spent about eighteen months bringing him drinking and cooking water three times a week because of SWW’s failure to certify all animal troughs in the area as compliant. How much time have SWW spent? Well dozens of letters and emails. Four or five inspections from your regulations team (once with two private plumbers in tow) inspecting a rainwater harvesting system that would not have been installed if it were not for your insistence that the leak was our problem and not yours. Three meetings with Mike Shannon and his colleague. Looking at www.goongumpas.com many times (100?) and also looking at the video of the “non” inspection several times. You have said that your 25 November 2016 letter response to my 10 May 2016 complaint took you three to four weeks to investigate and so on. How much has it cost SWW to pay all your salaries? I dread to think but at least you and the rest of SWW staff involved are paid whereas we are not. All of this is due to the fact that SWW installed meters without testing the supply and Allister Symonds and Alan Brand failed to spend a couple of hours installing a meter at Tailings End to try and find out why our pressure was low and dropped to zero for about an hour a day. I note that your letter states (regarding the £1,500 compensation offered (to one of us)) “I believe this to be an appropriate and reasonable offer”. Once again I do not agree and I suspect that Mr Bellward and Mrs Layte do not agree that the £0 offered to them is reasonable either considering all the time and continuing inconvenience they have had to put up with! Remember Mr Bellward, like myself and Mrs Layte, had to put up with zero water more or less daily for years. Mr Bellward started recording the dates and times the pressure dropped to zero in 2012 (His full list can be viewed HERE). A list of dates and times between 22 July 2012 and 20 February 2013 was provided to Allister Symonds attached to the 4 March 2013 email. The time taken to compile this list alone I am sure you will agree is worth more than £0. It should have been helpful to SWW in demonstrating the scale of the problem but was dismissed as a private matter as SWW’s responsibility ended at Tailings End but does it? Some of the documents and photos I have attached are only pertinent to the rest of this letter but I have attached them anyway and I am sure you will be able to recognize their significance. 1. Confirm that all animal troughs in the area comply with the regulations. 3. Confirm that you will inform all your customers of the dangers to their health from backflow from unprotected central heating header / expansion tanks. 4. Confirm that in future your employees take reports of low/ zero pressure in an area with nearby animal troughs very seriously because of the danger of backflow pollution to the supply and not just say “it is a private pipe and not our responsibility”. 5. Prove that Tracy Symon’s statement that the pipe after the Tailings End stop tap / meter enters Five Acres private land and does not continue down the lane towards Goon Farm. 6. Instruct your Regulations officers that water cannot defy gravity. 7. Tell Mr Mitchell not to write letters such as his 22 September 2015 one (attached) unless he is sure his information is valid. For the record I did not deny your Regulations Officers access to the loft at Goonhillend, there is / was no new pipework in the roof space so as to restrict access to the rainwater distribution tank in any way whatsoever, the roof is not dangerous except in so much as crawling boards are required to lay across the ceiling joists as a prominent notice next to the loft hatch states (see attached photo). Richard Harrison did not bring his own crawling boards for the 17 September 2015 inspection despite knowing they were required from his earlier visits and as can be heard in the video I offered to lend him mine several times but he did not answer. There is / was no covered pipework in the roof. There is obviously the normal insulation above the ceiling joists and around the tanks. I am sure you are aware of the expression “Mighty oaks from little acorns grow” Tracy. I am sure you are also aware of the expression “in the benefit of hindsight” and thus I am sure SWW are aware that the two acorns here go by the names of Allister Symonds and Alan Brand. My apologies this is such a long letter but actually it is only half of it. The other half will be published in January. Merry Christmas and (hopefully) a leak free new year to you all at South West Water. Whilst the meter at Tailings End was being read on 15 March it was noticed that someone was currently connected and had extracted some 817 litres. The meter stop tap was turned off at that point and this notice was placed next to the stop tap / meter. A padlock was put on the cover in an attempt to prevent the stop tap being turned back on as was the case in the third survey. It remains to be seen if anyone contacts SWW and reports that their water supply has stopped.